We are one team working in concert to draw on unique skills and abilities with a unified clear purpose—provide quality service, superior training and reliable results for our customers. 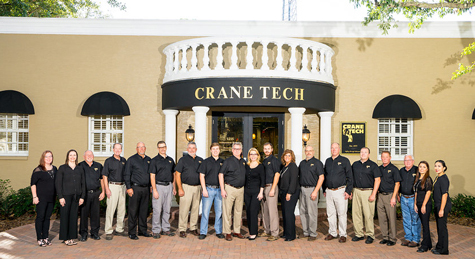 Founded by the man who started the industry of providing training for crane operators and now led by his son, our Crane Tech team includes some of the most experienced professionals from the material handling industry. His move to join the company turned into a life-long passion where his reputation is known throughout the material handling training industry. Bo gained his US Department of Labor Maritime Surveyor accreditation for lifting gear certification in 1984 and as Chief Surveyor in 1990; a position he holds to this day. Bo is a NCCCO Commissioner, has served on numerous NCCCO task forces, and sits on the Mobile Crane Written Exam Management committee and the Rigging Management committee. While Bo remains active in the day-to-day operations his passion, and what he describes as his primary responsibility, is ensuring that every service Crane Tech provides is of the highest quality, with an uncompromised commitment to technical accuracy, and efficiency for the end user. His experience goes well beyond railroad equipment and includes all types of mobile cranes, overhead cranes, container equipment, forklifts, aerial lifts and rigging gear. Tony’s key role at Crane Tech allows him to ensure that each prospective client understands Crane Tech’s dedication to providing a superior level of service. Tony manages the day-to-day activities of the field staff and directly oversees all on-site training services. He is very involved with several NCCCO committees, is a NCCCO Certified Operator and NCCCO Accredited Practical Examiner. Crane Tech instructors have a passion to teach others in the material handling industry how to work safely, while providing a dynamic learning environment. Every trainer has a minimum of 15 years of hands-on field experience operating and/or inspecting cranes and heavy equipment, and most progressed to the position of supervisor or manager prior to becoming an instructor. Our instructors have undergone the most stringent testing and qualification process in the industry—passing an interview that includes a minimum of six-hours of technical content testing and spending 60 to 90 days under senior leadership learning to provide training in accordance with Crane Tech policies and expectations. In addition, all Crane Tech field personnel are professional in approach and demeanor; further ensuring the quality of service they provide is second to none. Since Frank began as instructor and on-site safety consultant for Crane Tech, his steady hand and calm guidance has helped improve the reliability and safety for each person he serves. Frank is an NCCCO Certified Crane Operator. In this position Ben refined his knowledge and skill and oversaw the inspection and repair of critical overhead cranes and hoisting units. His experience working at a high level of quality control and expertise made him uniquely qualified to join our team and currently provides a number of operator and inspector services. Ben is an NCCCO Certified Overhead Crane Operator. Randy began outsourcing his teaching talents to a national management consulting firm, where he later found Crane Tech. Randy’s dynamic and energetic personality combined with his technical knowledge and skills of overhead cranes and rigging bring a unique set of problem solving skills to each client he serves. Randy served on the NCCCO Overhead Crane Task Force that determined the content of the certification exams (written and practical) and currently serves as Crane Tech’s representative to the NCCCO’s Overhead Crane Operator Certification committee. He is an NCCCO Certified Crane Operator and Practical Examiner. After receiving an honorable discharge he joined the International Union of Operating Engineers where he learned the trade of crane operator and construction equipment operation. Today Ron has more than eight years of crane and heavy equipment teaching experience that spans a wide range of equipment and industries. Ron’s most enjoyable assignments are to overseas locations where he has excelled in assisting clients from Africa to South America. Ron is a NCCCO Certified Mobile Crane Operator and Practical Examiner. Ethan is now an instructor, providing classroom instruction and hands-on coaching to teach proper operation to individuals in our mobile crane, aerial lift, signal person and rigging courses. His operating background includes hydraulic-boom cranes, lattice-boom cranes, overhead cranes, and aerial lifts. He is a NCCCO Certified Mobile Crane Operator and Practical Examiner. Paul is also a commercial pilot and was a flight instructor for several years. He is a NCCCO Certified Mobile Crane Operator. 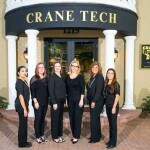 The quality products and services Crane Tech provides are facilitated and managed by Crane Tech’s professional office staff. From document management and accounting to sales and marketing, our friendly and knowledgeable team is here to answer any questions you may have.